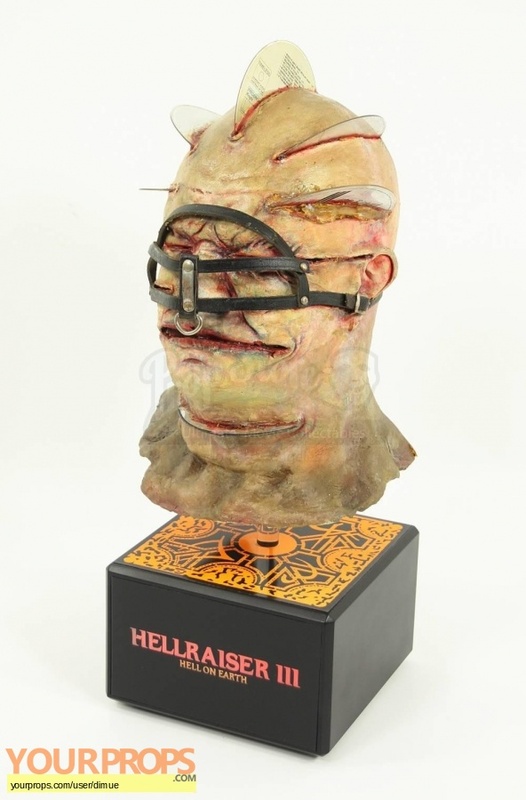 The striking ‘CD the DJ’ Cenobite head from the Hellraiser sequel, Hellraiser 3: Hell on Earth. This ghastly creature can be seen as one of Pinhead’s newly created cenobites, when Pinhead contrives to find a way a way to ensure he need never return to hell again. 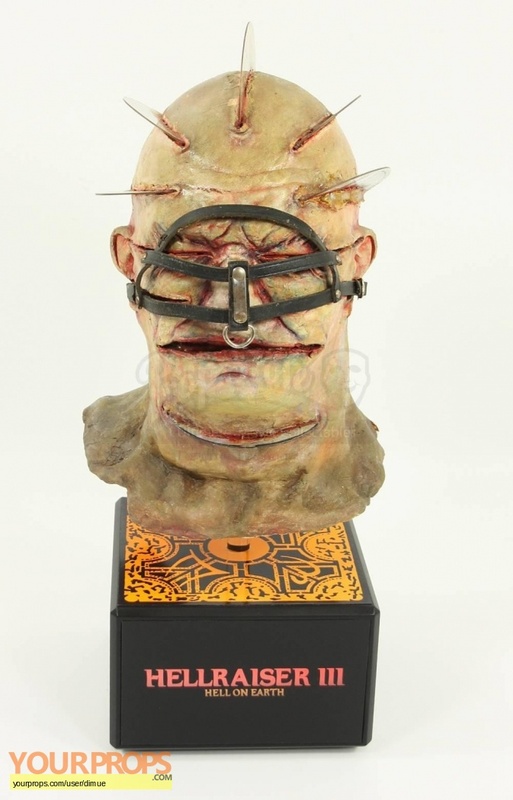 The face appliance is made from painted foam rubber and features leather strapping across his face, and CDs that really look as though they are buried deep in his head creating gaping bloody wounds. The leather strapping underwent some adaptation post-production when the piece was loaned to a low budget film, and also lost the ‘v’ shaped strips that were positioned around the nose. 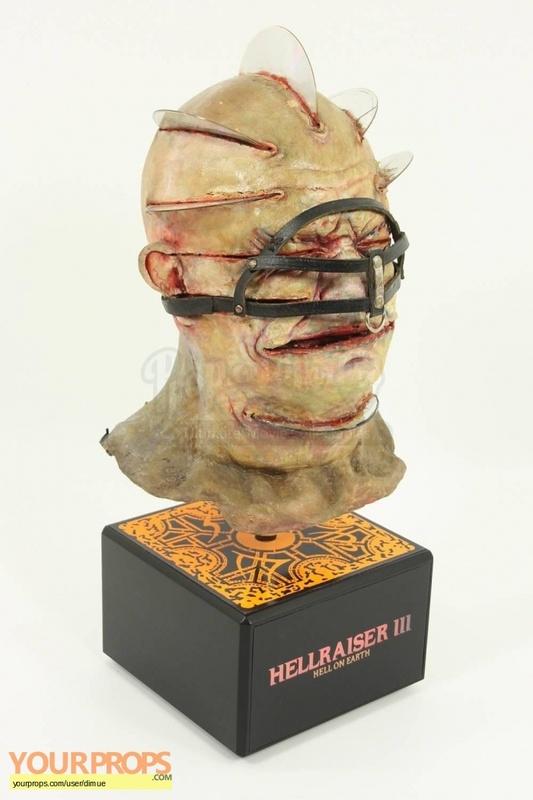 To ensure this piece stayed in fantastic condition it received some re-constructive work to the back of the head and lower chin by a UK creature FX specialist, so as a result it’s very stable and in great condition for its age. The mask sits on a life cast of the actor, which gives it perfect support and has helped keep it in such good shape and removing it would be strongly discouraged. To complete the fantastic nature of this great piece, it comes presented on a display stand that features the Hellraiser 3 logo that illuminates using ultra bright LEDs, controlled via a small switch at the back. Measures 58cm (23”) tall and the base measures 21cm x 21cm (8.25” x 8.25”). A truly stunning piece from the movie. Certificate of Authenticity This item comes with a Prop Store Certificate of Authenticity.